NEW Eats (PUB CHEESE TOTS!) at Friar’s Nook in Disney World’s Magic Kingdom! 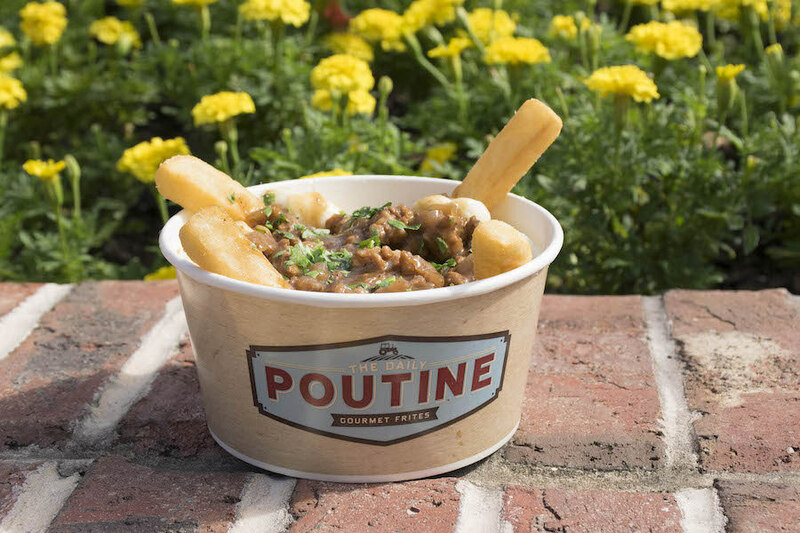 Friar’s Nook at Walt Disney World’s Magic Kingdom is known for a regularly changing menu, and right now there are two yummy eats that offer a lot of bang for the buck! 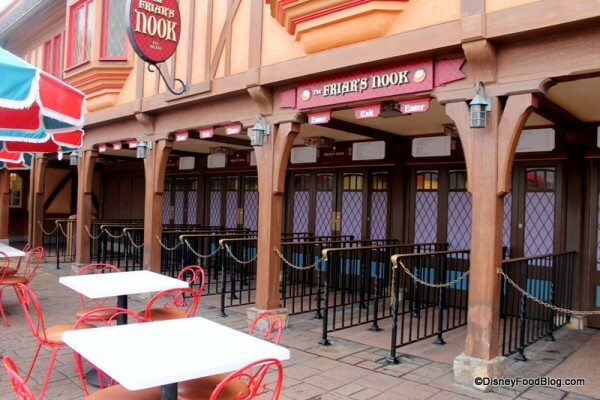 The last major change to the menu at Friar’s Nook added three intriguing tater tot dishes. Oktoberfest Poutine, anyone? At The Daily Poutine, you can find those thick cut fries topped with crumbled bratwurst, cheese curds, and a stout beer gravy. And just down the way (still in the Marketplace) at B.B. Wolf’s Sausage Co. you can find a straight up Bratwurst and Spaetzel. It’s almost time for one of our favorite events of the Fall season — the Walt Disney World Swan and Dolphin Food and Wine Classic! The weekend food festival is celebrating its sixth year, and once again in 2015, it will be held over Halloween Weekend. If you haven’t already, mark your calendars for Friday October 30 and Saturday October 31. 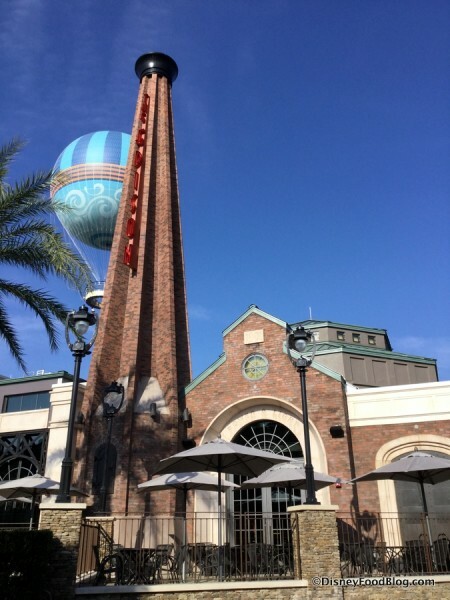 The Classic began as a weekend companion event to the Epcot Food and Wine Festival. 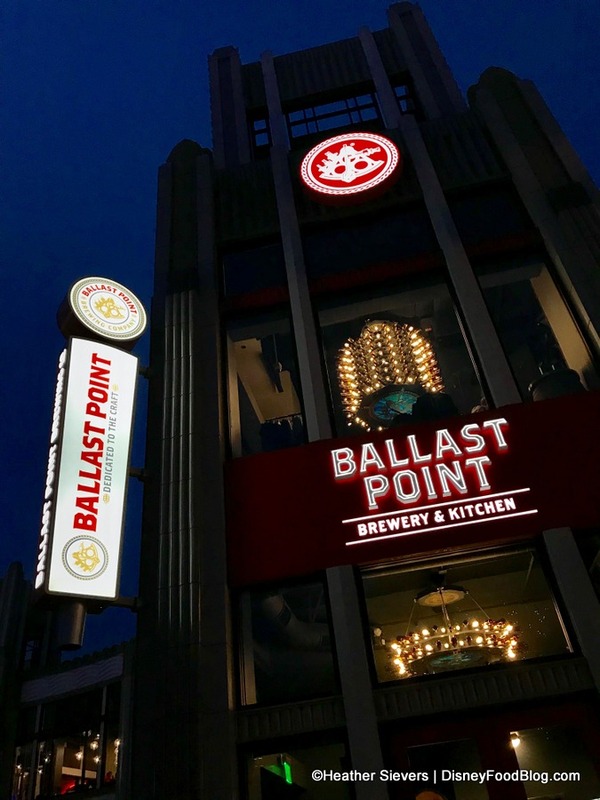 It’s comprised of two major components: Food and Beverage Seminars, and the Causeway Grand Tasting. Food and Beverage Seminars allow you to go in depth as you learn about a wine, beer, spirits, or even pasta. For more information, check out our reviews of the Modern Mixology Seminar and the From Base to Bubbles Seminar, two of the educational events that we’ve attended through the years. Helllllloooooo from Disneyland and the Troubadour Tavern! This hidden gem is a great place to grab a very quick bite in Disneyland. It’s tiny and doesn’t have much seating, but there are a couple of menu items worth getting, and you may even see a show! More on that later… . 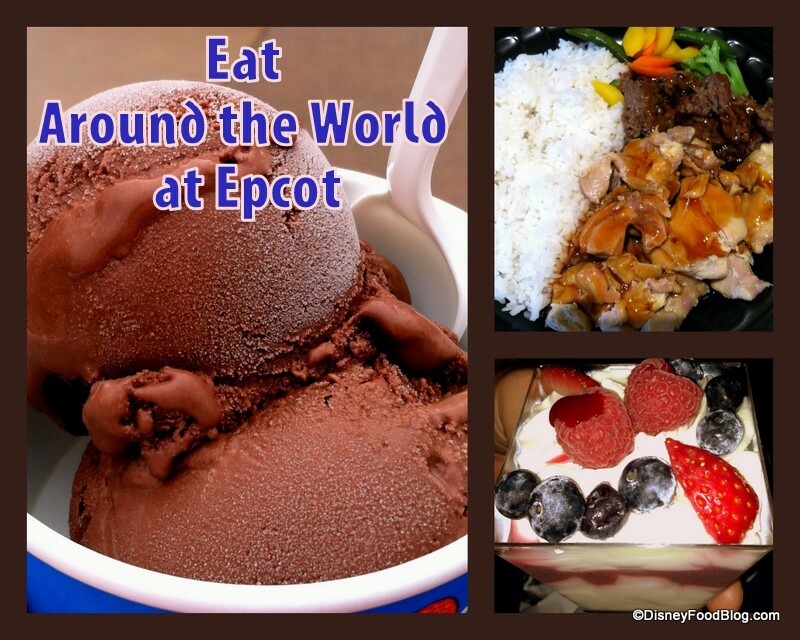 Ready to dine around Epcot? Yep, me too! Join me in welcoming guest author Anita Theiss with her review of some great Epcot eats! My husband and I recently spent a day at Epcot celebrating our anniversary. While there, we decided to taste a little something from each of the nations represented in the World Showcase. An “Eat Around the World” challenge, so to speak. It was a lot of fun, and we really enjoyed discussing which foods we liked best and which we liked the least. We followed a few simple rules for our self-assigned challenge. Rule One, choose one country-specific food item (no generic cookies or fries) to order from each nation and share it. (We had a slight breech of etiquette on this rule when we got to France, but more on that later.) Sharing meant that we could discuss what we thought of the item, and it kept us from eating too much. Rule Two, go to counter service restaurants, kiosks, or food stands only. It just didn’t seem right to take up a reservation spot for just one item. Rule Three, rate each food item on a scale of one to ten, with one being not quite so palate pleasing, and ten being the best thing to ever grace your taste buds. Our digestive expedition started in Mexico at La Cantina de San Angel with an order of nachos. 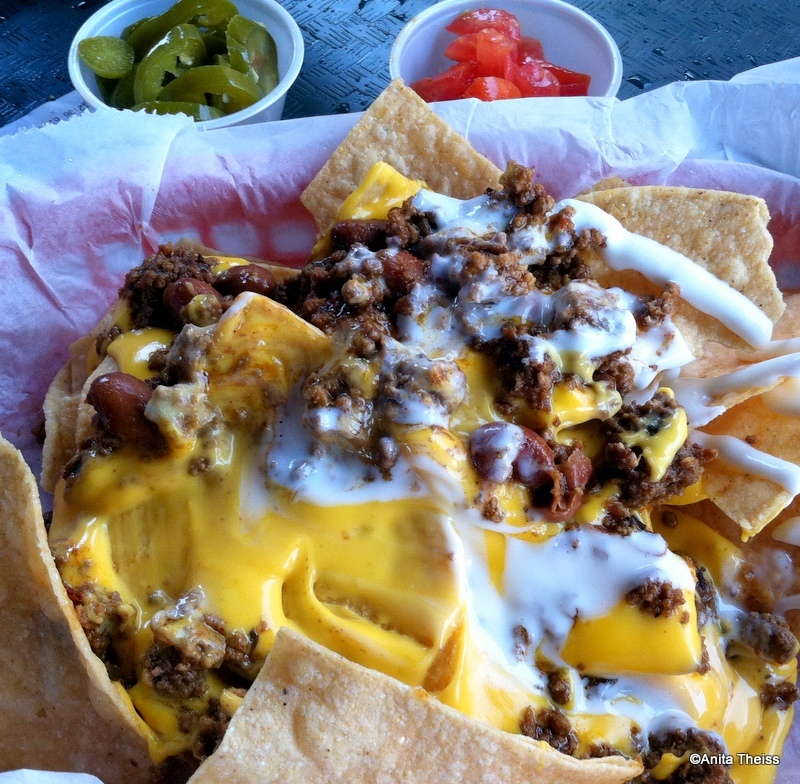 The nachos come with ground beef, beans, cheese, tomatoes, jalapeños, and sour cream. We ordered them with the tomatoes and jalapeños on the side -— my husband loves them, but I am not a fan. I enjoyed the nachos, but we both found them to be a little heavy on the cheese (if food can be too heavy with ‘plastic cheese’) and not heavy enough on the meat and beans. They had just the right amount of spice, and the chips were crisp. The portion was perfect for a meal, but these nachos are a great shareable snack as well. My husband gave them a 4, and I gave them a 6. We moved on to Norway and stopped at the Kringla Bakeri Og Kafé. There were several items on the counter that looked good, and I could not decide between the Troll Horn and the Viking Mousse. 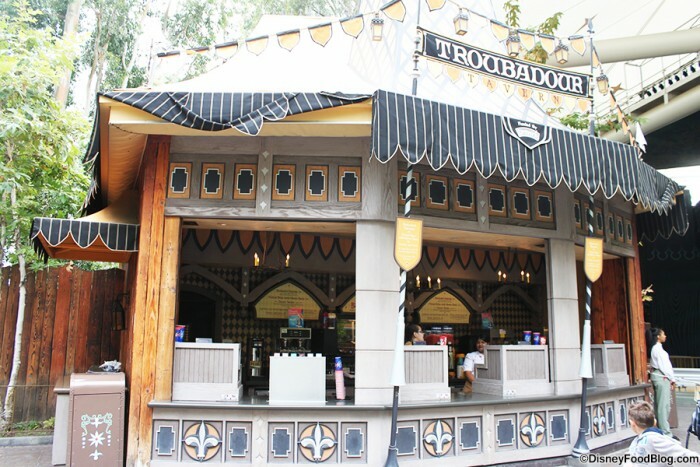 I asked the cast member behind the counter which of the two she recommended, and she suggested the Troll Horn, which is filled which cloudberry cream. The cloudberry cream was smooth and sweet, but not too sweet, and the pastry was tender but a little bland. 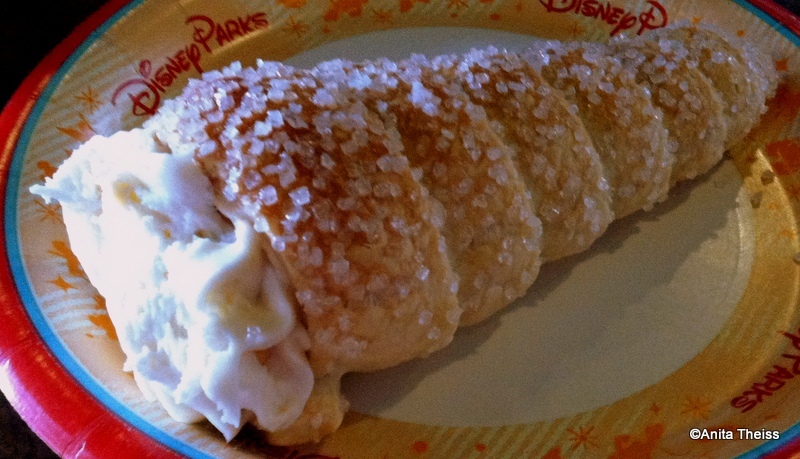 The sugar crystals sprinkled on top added a nice sweetness and crunch, but overall the Troll Horn was just meh (how do you like that technical culinary term?). We both gave it a 4 on our grading scale — not horrible, but we won’t be rushing back to Norway to get one during our next trip. The egg roll wrapper was both tender and crunchy, and the filling was flavorful with seasoned pork and crisp veggies. There were packets of soy sauce (and other condiments) which just added another layer of fabulous flavor. We both gave the egg rolls an 8.5; we would definitely get them again and feel that they would be an excellent use of a snack credit if you are on the Disney Dining Plan since they are easily shared. We moved on from China to Germany for a stop at Sommerfest. To be honest, I had my heart set on wrapping my lips around a Nudel Gratin for days, but I was starting to get full and knew that such a dish would be both rich and heavy. So, I passed on the Nudel Gratin (which I now regret — I really should have persevered) while my husband ordered a bratwurst. He loves a brat, and this one did not disappoint. 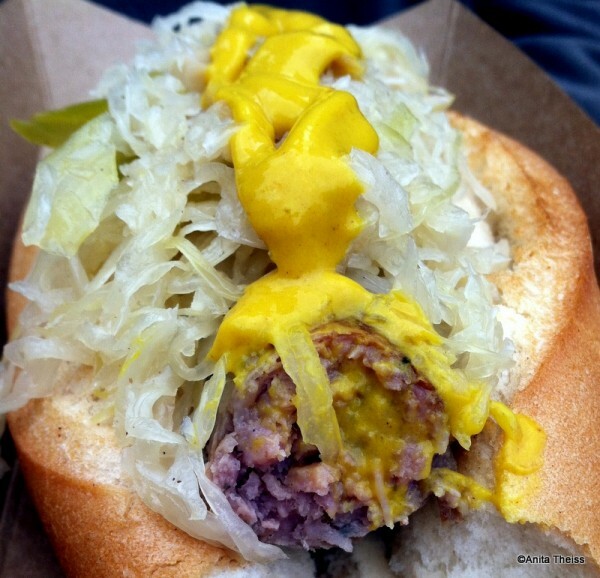 The bratwurst comes on a very large crusty bun topped with loads of sauerkraut. He said the sauerkraut was alright and the bratwurst itself was delicious, but he felt that there was just too much bread. The bun was quite large and had a pretty tough and crusty consistency. He still enjoyed it and gave it a score of 6. After a quick shopping break in Germany, we headed to Italy, which had me a little worried because there is no counter service restaurant. But as we were walking into Italy, I spotted Gelati — a nice little gelato stand, so I stopped for a cup of chocolate gelato. It was smooth, thick, creamy, quite tasty, and reminded me of a cold version of hot chocolate. It would definitely hit the spot on a hot summer day in Florida. 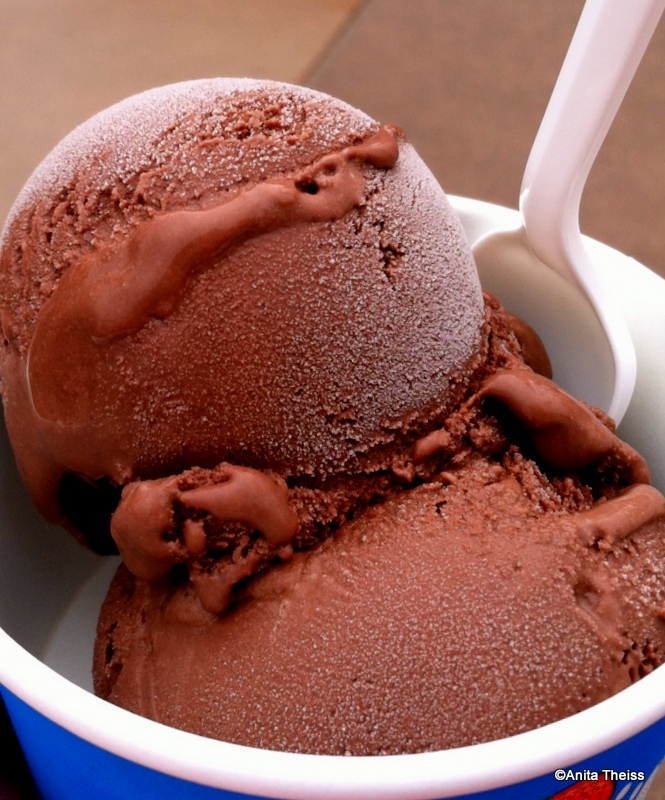 My husband had a taste or two of it, but he is not much of a chocolate fan and didn’t like it as much as regular ice cream. I, on the other hand, much prefer the thicker consistency of gelato to its thinner American counterpart and gave it a 7. Chicken Dance your way over to DCA! 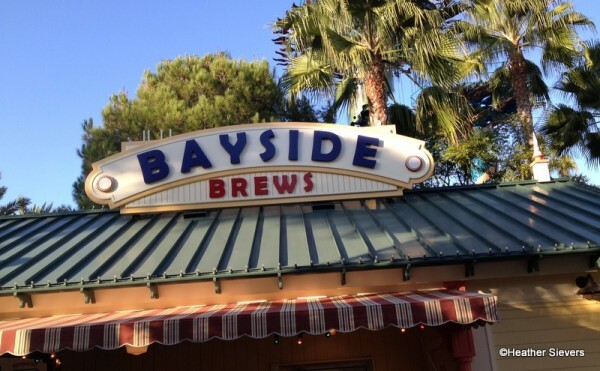 As part of their Limited Time Magic promotion, Disney California Adventure is celebrating Oktoberfest with some special items at Bayside Brews. Available through the month of October, the special Oktoberfest items include a Bratwurst Sandwich, Bavarian Pretzels, Gingerbread Bundt Cake, and two specialty beers on tap: Karl Strauss Oktoberfest & Hofbrau Munchen Beer. The Bratwurst Sausage is served in a garlic brioche with a side of hickory smoked bacon sauerkraut. 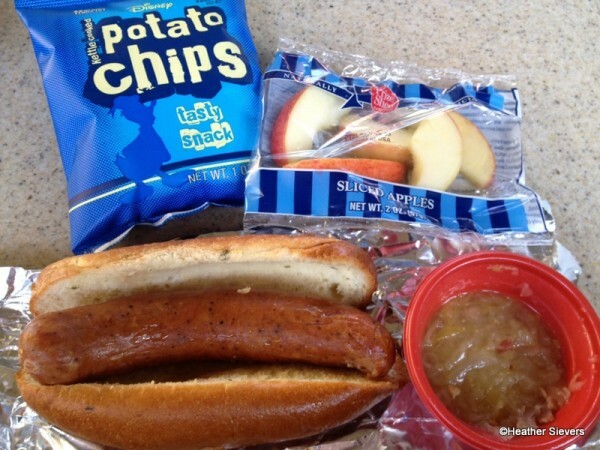 The sandwich is $8.49 and comes with a choice of apples or potato chips. 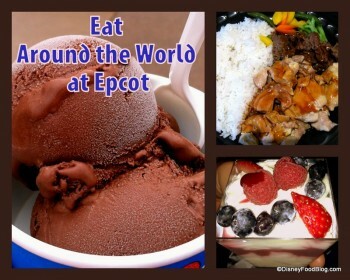 We’re getting closer and closer to the 2013 Epcot Food and Wine Festival! I can’t wait to start hearing about booths going up, banners being hung, and set up of the Cranberry Bog finally taking place! In just over a month, all the fun will get underway, and we’ll be Tasting Our Way Around the World with some brand new dishes. If you’re looking forward to it as much as I am, then you’ll enjoy this preview today of two terrific World Showcase Marketplace Booths — Argentina and Germany. 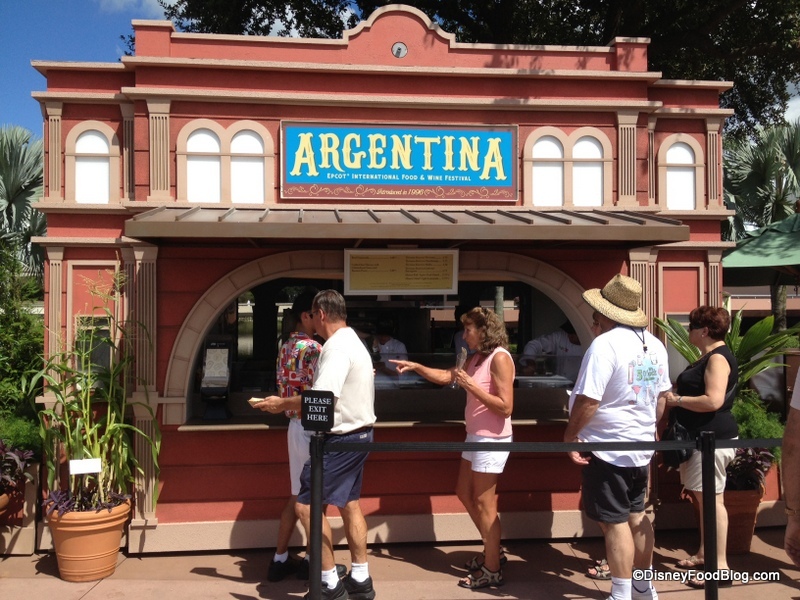 Argentina has been a very popular stop on the Marketplace Booth tour since its introduction in 1996. With an emphasis on beef and beautiful New World wines, it’s a food lover’s paradise! The attitude for Argentina’s menu seems to be “if it isn’t broke, don’t fix it!” We are happy to see some of the most flavorful and consistently delicious eats returning for another year here! Editor’s Note: New entrees and side items were recently added to the menu. 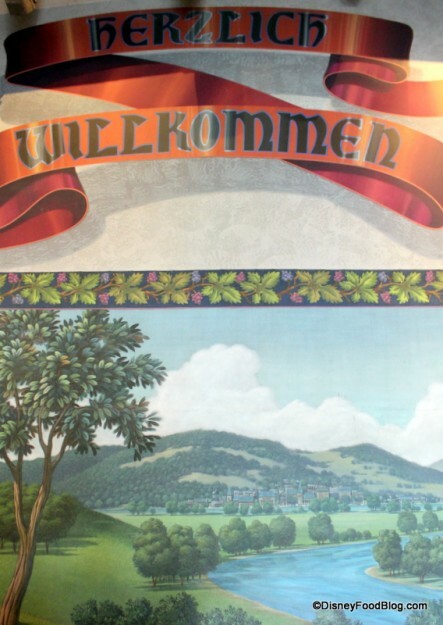 Alrighty, all — it’s time to take a little field trip to Deutschland!! We’re headed to Sommerfest! This place is as simple and what-you-see-is-what-you-get as possible, but sometimes simple and easy is exactly what you need on a long Epcot touring day. 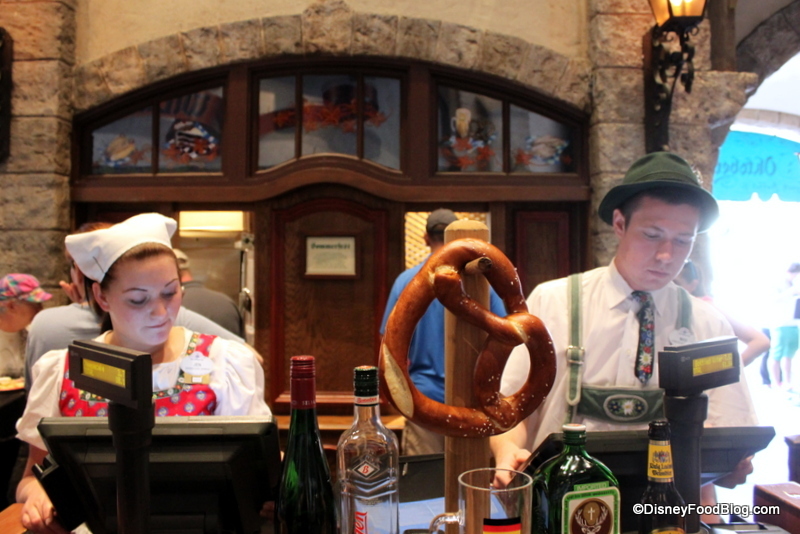 When you don’t have an advance dining reservation and you’re headed toward Epcot’s Germany Pavilion, you might consider stopping at this little counter service spot! Sausage. Pretzel. Beer. Cake. What more do you need? Let’s check it out! Atmosphere is kind of limited, since this is basically in the giant stone waiting area of Biergarten, the pavilion’s table service restaurant. That said, the waiting area itself is very well themed and has a fun old world feel to it. 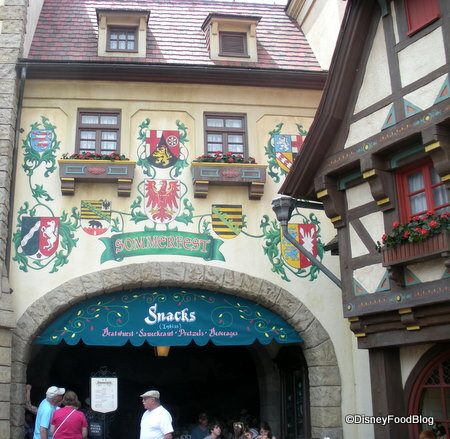 That’s really something I love about the whole Germany Pavilion. Sommerfest is located at the back of the Pavilion. Head through the “town square,” past the counter selling beer and Jägermeister on your right, to the awning that reads “Sommerfest Snacks”. Turn the corner to the left, and you’re there! It really isn’t much more than a serving counter. You’ll head back out to the sunshine to find a seat in the square by the fountain once you get your food. Speaking of seating — there’s not much of it. There are a few tables scattered inside the big covered area, and a couple of them outside as well. But if you’re visiting during prime meal hours or a busy Disney season, those WILL all be taken when you get your food. Many folks perch on the edge of the fountain, or even sit on the ground to eat up. And one other thing — there’s almost always a line here. But your patience will be rewarded.